Mario B. Ginnetti, PRA, RS, P.E. 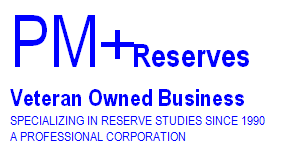 Why is a Reserve Study Needed? • Provide an Excel spreadsheet showing, 1) component, 2) quantity, 3) average and remaining useful life, 4) estimated cost and a 10-year expense projection so the association can develop their own spreadsheet for tracking changes. • Compare your financial status to the average of the last 100 properties studied. Comparison shows % Funded, Reserve Depletion Factor, Amount-on-Hand and Cost per Owner. • In addition to the 30-year financial plan included in all studies we also offer a 50-year plan to assure associations their contributions are adequate to avoid substantial increases when studies are updated and assure the association they are prepared for the long range needs of the property.